We love what some people do when they clearly have too much time on their hands. Yesterday, Jezebel published a story on one man who took recent issues of fashion and lifestyle magazine and added up their contents. All of us know that most glossy magazines act as an aspirational tool for many. 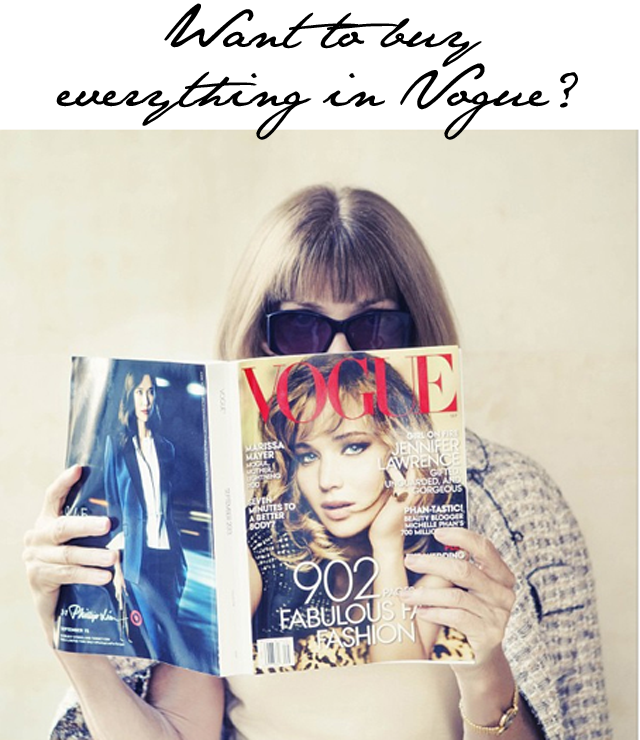 We joke about the fact that we all wish we could look like a girl who walked "straight from the pages of Vogue." Well, it turns out that having the ability to do that requires a bit of cash. Ok, more than a bit of cash is required. According to Journalist Noah Veltman, it will cost you a total of $343,368 to purchase every single item featured in the pages of Vogue magazine this month. If you want to just take a look from one page, the average cost if $850. Now, this may sound crazy, but we expected those totals to be a lot higher. How often do you find yourself flipping through Vogue and discovering a dress you love that is marked with a $5,000 price tag? That seems to be the case more often than not. So, when we first heard this was being done we were expecting $1million plus per issue. Seems men have it all a bit easier, however, as to buy the contents of GQ this month, it will only set men back $85,810.